You be the proud and happy new owner of a Phone, but the big form factor of the device may left you feeling the phone was extremely vulnerable. This holster is great if you like to use your phone for music while riding a bike or working out,driving,sitting without worrying of your precious phone get bended. This Holster are made of high end PU leather, with a nice and professional looking, it will be providing a consistant 7x24 protection to your phone . Meanwhile we have inspected all the pouches one by one on the materials, to ensure that is made of premium quality of the PU leather, which will allow you to use it in the next few years without worrying of the pouch gets aged. Suitable for most popular up to 5.2 inch device. May not fit all due to variations in the sizes of different models. Please check the dimesion before purchase! If you in the market for a Belt Holster or Case but are on the fence,this would be your best choise! ✔New!Carry and protect your phone with this professional looking. 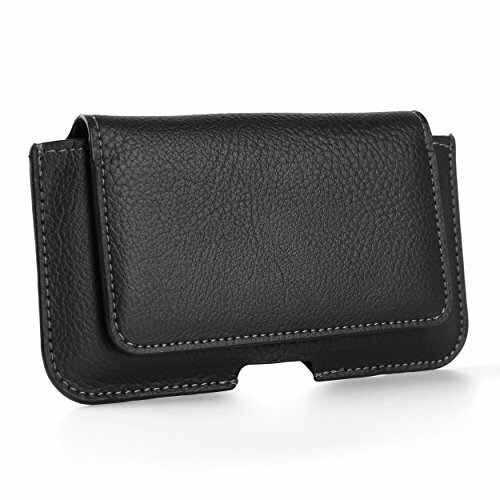 ✔Slot for business card,credit card etc and Strong magnetic closure to secure phone in pouch. ✔Premium PU Leather and Soft interior material prevent any scratch to your precious Phone. ✔Belt Loop keep phone on your body to deter loss or theft of phone.